England is the home of cricket, golf was invented in Scotland and rugby is the biggest sports in Wales. The United Kingdom is also home to some of the oldest bookmakers in the world. Global brands like William Hill and Ladbrokes were pioneers in sports betting industry and have continued to innovate with mobile gambling apps for Apple iOS, Windows Phone and Google Android devices. Horse racing and the English Premier League are probably the two sports that attract the most betting activity in the UK. British mobile bookmakers offer free horse racing tips, streams of live soccer games and competitive betting odds on international sports like NFL football and NBA basketball. Fantasy sports betting apps have also grown in popularity and are available on iPhone, Samsung, Apple Watch, iPad and more. 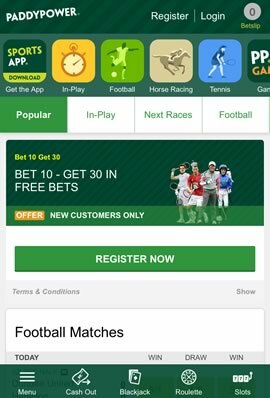 Paddy Power have developed one of the most popular sports betting apps in the UK. They have recently integrated with Facebook Messenger to allow their customers to place bets directly from the Facebook Messenger app if they wish. Watch live streaming of sports, horse racing and greyhound racing on your phone. Live statistics and visualisations of EPL, NBA, NFL, NBA, tennis and more. The new Kicker feature lets you earn when your team wins by a large margin. Flash Markets allow you to bet on 60 second markets like a free kick, penalty etc. Get the CARD CASH PLUS debit card that gives you access in your betting account. Login to your account in seconds with a secure PIN or Apple TouchID. The English Premier League is home to soccer giants, Manchester United, Arsenal, Liverpool FC and Chelsea and every saturday football fans wager millions of pounds on their favourite teams. Here are a selection of the best EPL apps for betting on games from tablets and smartphones. The proliferation of mobile sports betting has increased both the customer base and revenues for several bookmakers in the United Kingdom. Digital technology has played a key role, with UK sports betting enthusiasts embracing the host of innovative and intuitive mobile sports betting apps available on iOS and Android devices. But, as well as the iPhone, Samsung Galaxy or other mobile device catching the eye of UK sports bettors, the country’s general enthusiasm for sports also drives mobile sports betting growth. The English Premier League is the world’s most popular football competition. Teams such as Manchester United, Arsenal, Chelsea, Manchester City, Liverpool and Tottenham have become global brands with a devoted following across Europe, Asia, North America and Africa. The Scottish Premier League may not have the global notoriety of its English counterpart, but teams such as Celtic and Rangers are also renowned internationally. The top UK Premier League teams also feature in the UEFA Champions League, Europe’s premier continental club competition that mobile sports betting enthusiasts also flock to. The national teams of England, Ireland, Wales and Scotland are also closely followed, particularly during the World Cup and European Championship. In our forum, you will find a wide range of English Premier League tipping apps that offer gambling advice via Android and Apple iOS devices. Whether it is ruby union or rugby league, Britons embrace all things rugby. The Aviva Premiership is the domestic rugby union competition, with teams such as Saracens, Exeter Chiefs, Leicester Tigers and Wasps all prominent. UK teams also take part in the European Rugby Champions Cup, Rugby’s continental club competition that includes sides from France and Italy. The fortunes of the national teams of England, Scotland, Wales and Ireland are also closely followed, particularly during the annual Six Nations tournament and quadrennial Rugby World Cup. As for rugby league, the Super League is the premier domestic competition in Europe, featuring 11 teams from England and one from France. Teams such as Wigan Warriors and Leeds Rhinos are traditional powerhouses. As with union, there is also a World Cup held every four years, with England one of three regular contenders for the top prize alongside New Zealand and Australia. All of the iPhone bookies we list have a strong focus on rugby sports betting. UK sports fans have long been infatuated with tennis but their interest has sky-rocketed since Andy Murray developed into one of the world’s best male players. Murray is a three-time grand slam winner, duel Olympic gold medalist and undoubtedly one of the country’s most successful tennis players of all time. On the women’s tour, Laura Robson, Heather Watson and Johanna Konta have enjoyed modest success but nonetheless highlight a growing presence of British players on the global tennis stage. The United Kingdom also hosts the most iconic of the four tennis grand slams each year, Wimbledon. Held at the All England Club in London, Wimbledon garners global interest and generates a spike in mobile sports betting traffic on tennis. Mobile gambling on tennis is well catered for on all the major bookmaker apps for Android and Apple iPhone.